Offering the most amazing and the largest variety of games in the industry on one website, Videoslots.com is an established online casino that runs smoothly since 2011. The platform is operated from Malta and the United Kingdom, and the main company that holds its dominant shares is Panda Media NV. The platform offers a staggering 2.200 possible games for the players to choose from, including video games, slots, poker, blackjack and every single other game you can think of. Play at one of the best sites online these days. You have a lot of options. Although they offer an immense variety of games, the focus with Videoslots.com is on the quality, rather than the quantity of the available games. You’ll find them all there, including The Finer Reels of Life, Immortal Romance, The Dark Knight, but also the Mega Moolah Jackpot Series of slot games. They all operate under the Microgaming brand on the portal, which has bought the rights for slots from other big suppliers like Quickspin or Genesys, which means you get to play some of their games as well on the same website. The array of the games that Videoslots.com offer doesn’t end here. In fact, big companies like Aristocrat, Net Entertainment, Play’n Go, NextGen and many others operate on the platform, as well as live dealer games. You might believe that such a big list of games can become quite hard to navigate through, but because of the great filtering options available, you are guaranteed to land on the game you desire in no time. Don’t be fooled by the “video slots” name of the platform. You can very well engage in various table games that are available for the players, like Roulette, European or American, Blackjack, Craps, Stud, Poker, Casino Hold’em or Baccarat, and many others. If you’re a fan of video poker, you have more than 25 varieties from where to pick your favorite. There’s also a series of progressive jackpots on the platform, with the most renowned being the Mega Moolah Jackpot, offering multi-million dollars prizes in cash, and won more than once for a total of $6 million. The other jackpots available on the site are King Cashalot, Tunzamunny, Fruit Fiesta and Major Millions, just to name a few. The payment policy for the jackpots is incredible, Videoslots.com ensuring a single, direct payment if the jackpot won is over $60.000, which is a unique feature. All the major credit cards, along with e-wallets and also direct bank deposits are accepted for paying for the real money games available on the Videoslots.com platform. You can withdraw money once per day for free, but also by paying a small fee for any additional withdrawals. There is a $30,000 per month payment limit for players that are not in the VIP program, excluding any wins that come from the progressive jackpots on the site. Usually, a withdrawal is handled in less than 48 hours, depending on the country where the player is playing from and other bank arrangements. Any money won are held for revisal for up to 24 hours. For the safety of your private data, the documents that you are required to present when playing for real cash are safely uploadable directly to the platform, not via email or postal services, which can be rather insecure. If you’re experiencing any sorts of problems, you can speak to a Videoslots.com representative from Customer Support via email, phone or live chat. You can have a Customer Support representative helping you at any hour of the day or night, as the service is available 24/7. Videoslots.com is ready to welcome any new player with a sign-up bonus, as most online casinos do nowadays. Still, the interesting part of the rewarding process of the platform is its loyalty program, which does sound a bit too great to be true. Nevertheless, it is and it works like a charm. To summarize, Videoslots.com offer a 25% payback of the profit that the platform makes every single week. In effect, they pay you back 1% of the gains made on slot machine wagers, so every player gets a percentage of the whole winnings which is calculated by the sum that they play in a week. It doesn’t matter if you win or lose on the wager, but just that you rolled that money on the platform for that week. So just by playing with real money on the site, you’ll get a small sum in your account at the end of 7 days, which might be helpful if you’re having a rough week and are in need of some funds. The online casino operates under the eCOGRA standards which allow for legal and unhampered random number generator services and payout rates calculations. 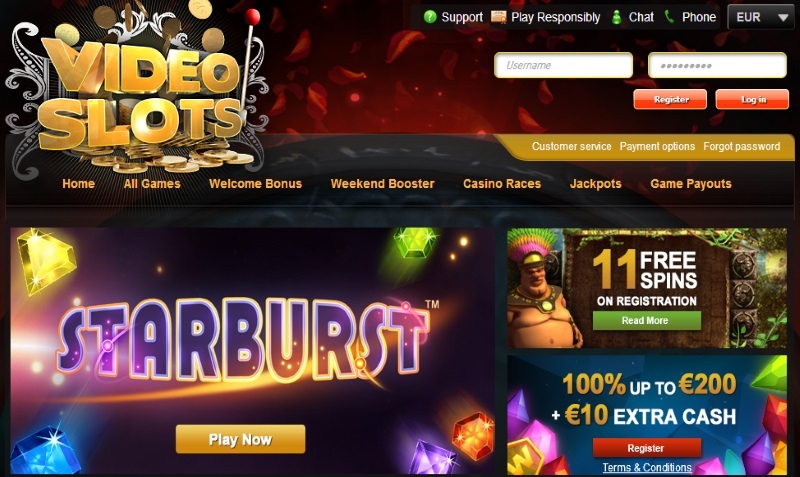 Videoslots.com are authorized for everything that involves money spend online, to the security of personal data, to the actual law of the slots and casino games that people play online, so that’s not a reason to consider when thinking about not playing on the platform. The payout rates are calculated monthly, which can be a great source of information when choosing your next slot or any other game. As usual, please remember to play these games in moderation, especially if you’re doing it with real money. As soon as you get the feeling that you might be heading towards addiction, seek professional help.